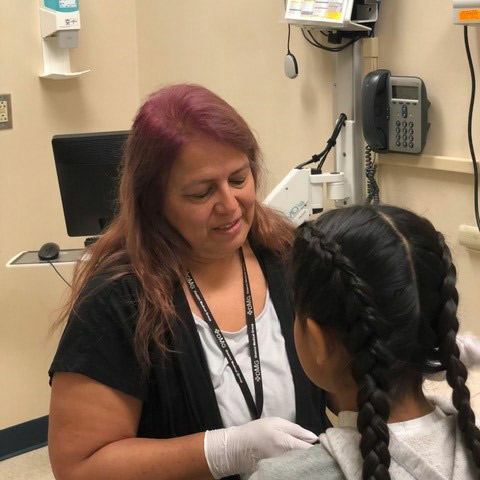 During my recent visit to our Whiteriver Outreach Orthopedic Clinic, I had the opportunity, once again, to help children and families in Northern Arizona with their complex healthcare needs. DMG CRS has several outreach clinics, like this location on the campus of the Whiteriver Indian Hospital, serving the Fort Apache Indian Reservation and the communities of Globe, Prescott, San Carlos and Show Low. For as long as DMG Children’s Rehabilitative Services (DMG CRS) has been around, we have been serving Whiteriver Indian patients, providing young patients the care they may not receive otherwise in their rural, remote communities due to transportation or mobility challenges. We work very closely with patients’ primary care providers (PCP), outreach coordinators as well as x-ray and lab departments within the hospital to coordinate care and ensure all the pediatric patients’ needs are addressed. DMG CRS pediatric orthopedic specialist, Louis Vu, MD, has been caring for patients at the Whiteriver clinic for more than five years. I have been working with this clinic for 17 years and have gotten to know many of the families very well. Serving this community is a pleasure, and I appreciate the opportunity to learn more about their culture and values. They are family-focused people who respect their elders and are also very private. As a healthcare worker, understanding these values helps me serve the patient better- not just addressing clinical concerns but doing so in a way that makes the patient and family feel comfortable and respected. In addition to orthopedics, DMG CRS also has pediatric specialists in genetics and cardiology- Margaret Ann Pearson, MD, and Daniel Miga, MD respectively- serving patients in Whiteriver. We also work in the surrounding communities, including Bylas, Camp Verde, Payson, Peridot, Safford, Springville, St. Johns, and many more. I really appreciate all that the DMG CRS team from Phoenix does for families in Northern Arizona. And, I see daily how grateful the families are for what we are doing for them.